At the Santa Barbara Bowl, Friday, August 22. The multitalented Ben Harper led his band of Innocent Criminals through a mix of rock, soul, and classic covers during Friday night's Bowl show. The night was something surreal; the air was warm, the Bowl was packed, and when the sun set at almost exactly 8 p.m., the Innocent Criminals poured onto the stage and launched into a full-blown jam session. The band consisted of the usual rock and roll fare (guitar, bass, drums), but also an organ and a complete percussion station. 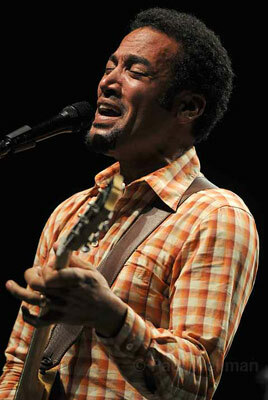 When the Criminals’ ringleader, Ben Harper, took his place in front of his guitar, the high-energy sestet was complete. But the cover songs came eventually. In fact, one of the high points of the evening came when Harper reminisced about the loss of former Bowl operations manager-and dear friend-Rex Marchbanks before dedicating Bob Dylan’s “I Shall Be Released” to him. The harmonies were time-stopping, and Harper’s guitar mastery was undeniable. Harper also covered was Bill Withers’s epic 1972 soul hit, “Use Me,” which found the singer sounding slightly withdrawn. But the dedicated audience paid no mind as they clapped along in unison. Shockingly, it was during this number when Harper demonstrated the vastness of his impressive vocal range, driving his crowd crazy with admiration. Throughout the evening, the very narrative band took to telling stories via song, which was as endearing to hear as it was fun to observe. And Harper was sure to peacefully feed his hits, “In the Colors” as well as “Diamonds on the Inside,” to the group. In the case of the latter, the audience witnessed as the Criminals each commandeered a solo portion of the otherwise acoustic original, before Harper rejoined and ended the tune a capella.